It was a normal, decent Friday morning until a few minutes ago when I saw the news about the Supreme Court’s ruling on marriage equality, and suddenly I am having urges to go hug people and celebrate. I have a FB friend who is saddened by this ruling, and to people who feel this way I just want to say —– I understand that marriage has traditionally been a religious institution, but if you still feel that marriage in 2015 (or 2005, or 1995) is based in religion then you are not paying any attention. What you want to do with your religious beliefs is your decision, but for you to be saddened because all of your fellow Americans can now receive all of the benefits that go with marriage is just, well, silly. If your job had been to make sure that marriage remained a religious institution, you failed several decades ago. So please stop being saddened that the majority of Americans are overjoyed this day because we are finally allowing equal marriage rights for all of our citizens. “No union is more profound than marriage, for it embodies the highest ideals of love, fidelity, devotion, sacrifice, and family. In forming a marital union, two people become something greater than once they were. As some of the petitioners in these cases demonstrate, marriage embodies a love that may endure even past death. It would misunderstand these men and women to say they disrespect the idea of marriage. Their plea is that they do respect it, respect it so deeply that they seek to find its fulfillment for themselves. Their hope is not to be condemned to live in loneliness, excluded from one of civilization’s oldest institutions. They ask for equal dignity in the eyes of the law. The Constitution grants them that right. The judgment of the Court of Appeals for the Sixth Circuit is reversed. Go placidly amid the noise and haste, and remember what peace there may be in silence. As far as possible without surrender be on good terms with all persons. Speak your truth quietly and clearly; and listen to others, even the dull and ignorant; they too have their story. Avoid loud and aggressive persons, they are vexations to the spirit. If you compare yourself with others, you may become vain and bitter; for always there will be greater and lesser persons than yourself. Enjoy your achievements as well as your plants. Keep interested in your own career, however humble; it is a real possession in the changing fortunes of time. Exercise caution in your business affairs; for the world is full of trickery. But let this not blind you to what virtue there is; many persons strive for high ideals; and everywhere life is full of heroism. Be yourself. Especially, do not feign affection. Neither be cynical about love; for in the face of all aridity and disenchantment it is perennial as the grass. Take kindly the council of the years, gracefully surrendering the things of youth. Nurture strength of spirit to shield you in sudden misfortune. But do not distress yourself with imaginings. Many fears are born of fatigue and loneliness. Beyond a wholesome discipline, be gentle with yourself. You are a child of the universe, no less than the trees and the stars; you have a right to be here. And whether or not it is clear to you, no doubt the universe is unfolding as it should. Therefore be at peace with God, whatever you conceive him to be, and whatever your labors and aspirations, in the noisy confusion of life keep peace with your soul. With all its sham, drudgery and broken dreams, it is still a beautiful world. Be careful. Strive to be happy. I am overly inclined to compare myself to others. I need to stop. Just because I might do things differently than other people does not mean that my ways are inferior – and even saying that sentence aloud makes me want to laugh at how absurd it sounds. I am less talented than some people in some ways, and more talented than some people in other ways. Always there will be greater and lesser persons than myself, so why bother comparing myself with them at all? Why do I struggle to embrace myself the way that I am? True, it’s good to be motivated to be a better person, but it’s not good for that motivation to be a negative voice in my brain telling me that I’m not good enough the way I am. Sometimes I feel like I need to go to a cabin in the woods and live by myself for about 6 months. Seems like that would be a good amount of time to allow me to…sort of remember who I am, and focus on my passions and loves, and remind me of why I am alive. Every so often, I’m amazed at how easy it is to get stuck in the 8-5 office rut; I get up, I go to work, I come home, I have dinner, maybe watch TV, maybe work on a craft project, maybe read, then go to bed. I was telling Brittany last night that I have very much shied away from trying to make my passions into my livelihood, because in my mind forcing a passion to be a career is a good way to kill it. And so I go to my day job and try to remember my passions after work (and sometimes during, if I’m not too busy). I don’t like this very much. I am trying to be thankful. 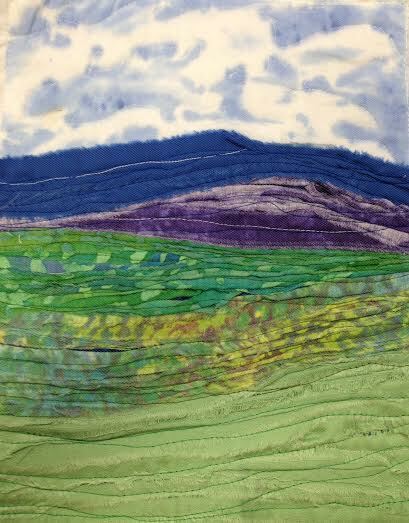 I’m finding myself wanting to spend the weekend quilting, rather than spending it leathering – which is what I’m going to be doing. I need to try to knock out that saddle bag for my coworker…the extra money would be REALLY nice to have, lemme tell you! Spending $100 on renewing my tags, while necessary, is no fun and all I have to show for it is a sticker that says “16.” Hmph. Or I could also just stop at Fat Mo’s for lunch. Hmmm. There’s an afternoon show at Centennial Park that we’re going to…hm, would probably be a good idea to have some leather pieces cut out so that I can take them to sew while we’re there. Maybe I’ll do that tonight. Got some sheer fabric yesterday and tried again. 1) I really like the clouds. 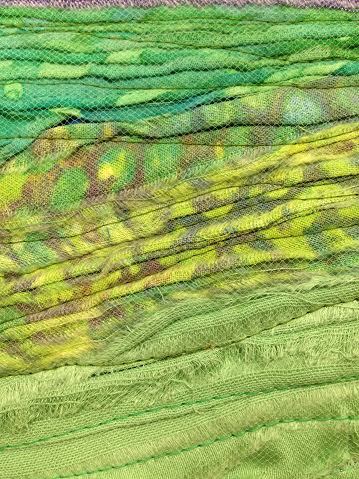 The free motion stitching was WAY easier than I’d been imagining, and so was painting the fabric. I need a darker shade of the blue and maybe a different color – more sky blue, less cobalt. But regardless – I’m happy with my first try! 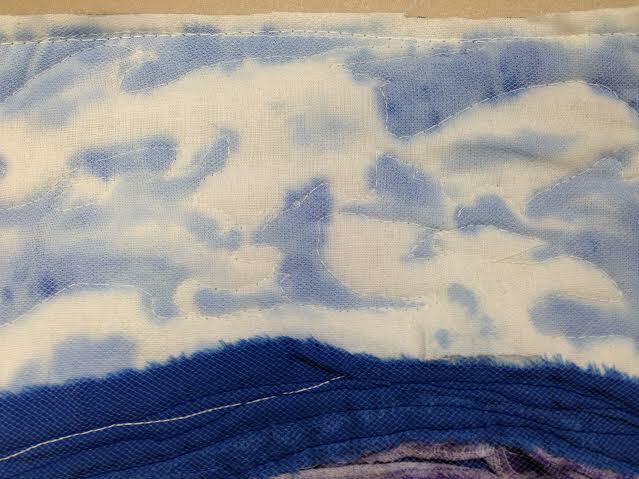 2) Obviously I need to use a darker thread when stitching in the blue and purple hills. Oops. 3) The whole thing is crooked, which I don’t mind since this was purely for practice, but next time! 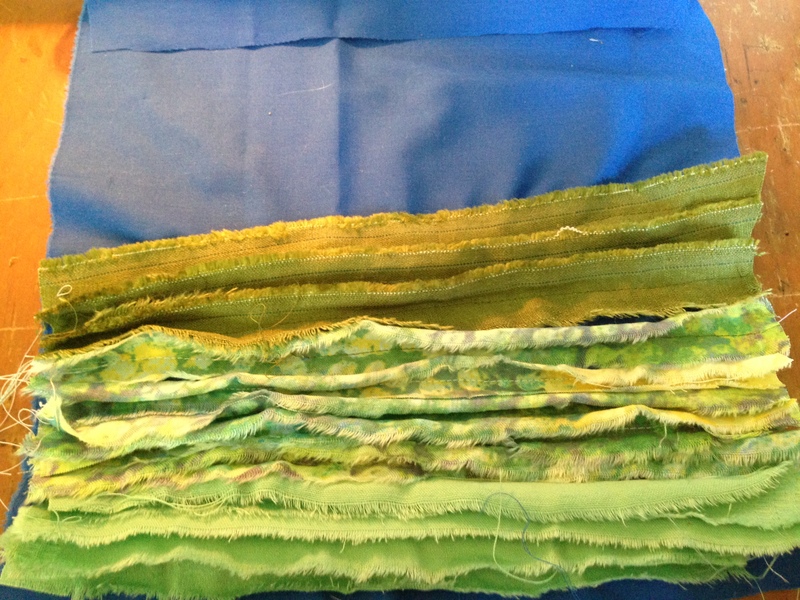 I think this will be a helpful technique in doing the Yonder quilt, though I might end up putting that one off for a bit until I can learn more. 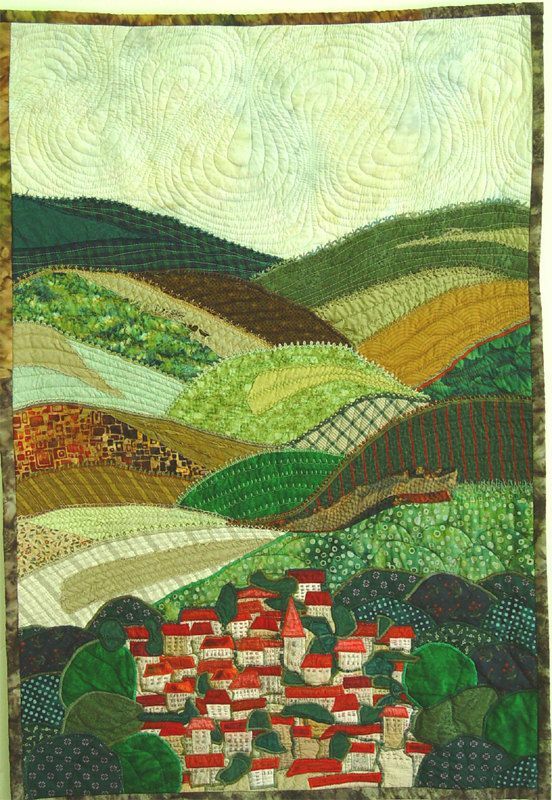 I found this book called Lovely Landscape Quilts that’s about $20 on Amazon and at Parnassus (which…I need to not be buying books from Amazon…) so I might end up getting that book. I’m sure it’d be helpful. I’m not totally blowing off the leather stuff….one of the sales reps at work asked me to make him a saddle bag-style laptop case and I quoted him $175, so I’m going to work on that over the weekend. But I’m way more excited about the quilt. And also wish I could stay home all day and just make things. Bah. I can’t remember if I mentioned – but the FIRST quilt I’m doing is going to be for Stephen’s bed. I’m not a huge fan of his current bedspread (which obviously is nothing personal)…it’s just very generic, and, uh, yeah. Have been itching to start a new quilt lately. The last one I made was the baby-sized quilt for A/M/M as a Christmas present, and that’s been a while ago now. 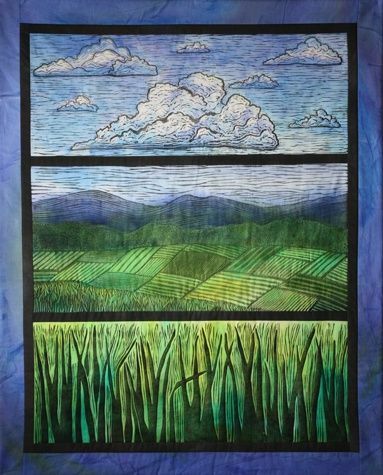 I would love to learn how to make landscape quilts — they are just some of the most gorgeous pieces of art I’ve ever seen. Etc. Aren’t these beautiful?? I pinned some even more stunning examples on my Sewing Ideas Pinterest board, but these are the two that I’d most like to try to copy. So, I found a cheap copy of Yonder on Amazon and bought it. This book has so many gorgeous landscape illustrations, and right now I think that it would just be wonderful if I could copy one as a quilt. While the book is shipping, though, I need to practice some techniques. A couple of nights ago, I tried doing some curved sewing and it wasn’t as easy as I was hoping, so I need more practice. I also found this website which offered a lovely technique…but as you can see from the pictures below (taken over my lunch break so it’s not like I tried all THAT hard), I need to work on it. And these are my pictures. 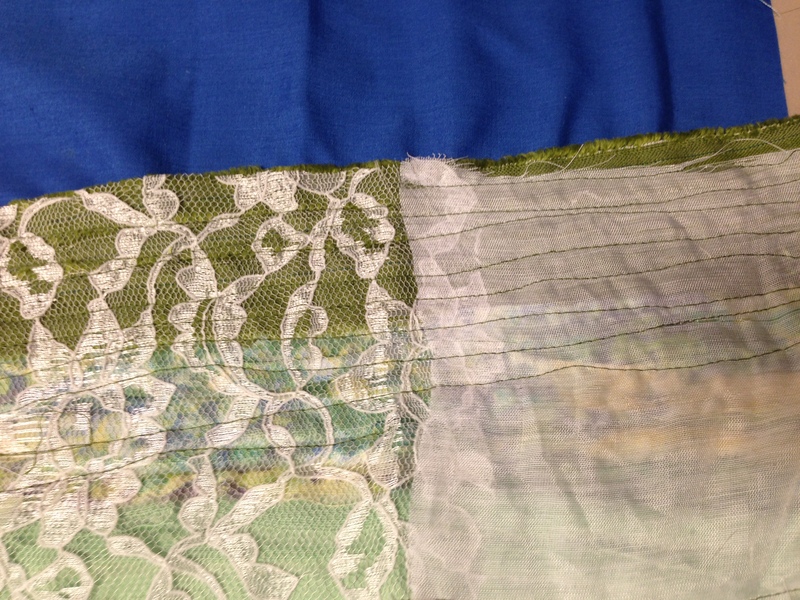 I obviously need some sheer fabric for this – lace and almost-sheer white fabric are not cutting it. On Saturday, we grilled two kinds of chicken. First was with a dry rub (paprika, cayenne, garlic, onion powder, salt, white pepper, black pepper, um, I feel like I’m forgetting something…) which was absolutely delicious. Second was a grapefruit coriander glaze – made with grapefruit zest and juice, garlic, salt and pepper, honey, and tons of coriander. (Which is like my favorite spice, in case you wondered.) That one was also good, and awfully different from the dry rub chicken which was hot and spicy instead of sweet and zesty. Anyway, so there was a whole breast of each left so we de-boned it, and I just had a sandwich with the leftover grapefruit coriander chicken. The sandwich was chicken, bleu cheese, avocado, and mayo – on grilled sourdough. OMG IT WAS THE BEST SANDWICH I’VE HAD ALL MONTH. Even better than those fresh mozz sandwiches yesterday. I might be biased because I was much hungrier eating that chicken sandwich than the fresh mozz sandwiches, but still. Oh and also, I brined the chicken for about 3-4 hours before we cooked them, and as far as I can tell it was helpful! We didn’t have a control so weren’t able to make scientific comparisons, but. I’m having a hard time believing that it’s already Monday. This weekend absolutely flew by and was by no means long enough. Stephen wrote a composition for voice and strings/woodwinds/french horn, and the performance was yesterday – and practice on Saturday. The concert was great and Stephen’s piece was the best. His mom and sister drove up for it, and we all went to a Nashville Symphony performance in a park last night. It was fun, but tiring. I did not want to get out of bed this morning – which is really nothing new, but. It’s Monday, and finally feeling like summer outside. Summer is the most depressing season of the year to me – because I just struggle in hot weather to feel good. Also, the sky tends to be pretty hazy for most of the summer; the crystal clear blue skies of spring, fall, and winter all seem to be sort of obscured during summer by a film. Maybe that’s just my imagination…I don’t know. But I’m bored and having to spend every free cent this month on renewing my car tags and paying the IRS, so I’m trying to think of some new things I can tackle without spending money. Sorry to say that I need a break from making leather stuff. I’m just tired of it. I want to do it because I enjoy it, not because I feel like I have to do it. So that said, one thing I need to do when I get home is clean the house. Been gone all weekend and it needs some TLC. I also need to start exercising, because if it does nothing else it at least makes me feel better and is free. I’ve also been thinking about making a new quilt. I still haven’t made that chess quilt…and it’ll happen at some point, but I want to make something different first. I bought a couple yards of map fabric a few months ago and have been saving it for something good…maybe I’ll quilt with that. I’m thinking that I should do something other than a typically-patterned quilt… but so far haven’t felt terribly inspired one way or the other. Anyway, quilting. That’s an option. Also I’ve felt lately that I need to be doing more drawing and/or painting. I sketch every now and then, but not regularly and not seriously. I would be better at drawing and painting if I would actually practice drawing and painting. Why is it that I enjoy doing both of those things, but I so infrequently do them??? I don’t know. Probably has something to do with all the myriad of other things I let distract me. I miss college sometimes because structure – while annoying and confining – can be so good for me. Some days I can be good at going home and knocking stuff out after work…but some days are pretty much the complete opposite. I guess it’s ok to have both types of days, but the days that I can check items off of my mental to-do list are days that make me feel better about myself. THAT SAID, after work today I’m cleaning the house, doing some yoga, and either starting a new quilt or working on a new drawing. There you have it.